If for even a second you thought you weren’t missing anything by coming out to the sixth annual The Woodlands Idol competition… if for a moment you thought there was no way anyone around here could compete with those selected to appear on American Idol or The X Factor… you, my friend, are sorely mistaken. Understand that I say this as one of those who, before last Friday, thought the exact, same thing. ‘No big deal. Just a local singing competition, nothing more than karaoke with a prize.’ Wrong. Wrong, wrong, wrong. We’ve all seen it; the video someone links on Facebook or sends in an e-mail with some guy or girl bursting out in song and blowing the judges (and audiences) minds. I’ve fallen victim to goose bumps or jaw drops many times myself seeing those. Now imagine getting to be there for those moments. That happened at least three separate times last Friday, as I sat and watched seventeen different local amateur singers put their own spin on songs as vastly different as those performing them. Rebecca Adams (#2) did a great job with Wynonna Judd’s “What The World Needs Now” – which, I have to say, even as someone who’s not a fan of country music, is a version I love far more than the original, classic version. Speaking of country music, Carly Winsman (#6) channeled Miranda Lambert quite well with “Gunpowder & Lead”, and Lacey Prieto (#14) didn’t do too bad herself with Carrie Underwood’s “Last Name”; both of them gamely hitting their marks with those growling, angry girl sounds. In a tie for ‘guys that sound just like Michael Bublé’, Bryan Kennedy (#5) crooned a smooth performance of “Georgia On My Mind” and Jim Tillmans (#17) gave us all a bit of late-summer “Fever.” Bringing up the rear with the oldest songs of the night was a none-too-shabby Frankie Pizano (#15), who threw in a few dance moves while singing Chubby Checker’s “The Twist,” and Bridgette Crabtree (#16) and Timothy Blair (#8) brought in the ’70s vibe with Crystal Gayle’s “Don’t It Make My Brown Eyes Blue” and The Temptations “Papa Was a Rolling Stone,” respectfully. But the one that completely blew my mind (and everyone else in the audience that night – not to mention the judges, Scott Thompson, of Wildfire Entertainment, Dana Tyson, of Sunny 99.1 and Michael Fuller, of Fuller’s Vintage Guitar) was lucky #13 Jon Sheptock. Jon stepped onto the stage looking just a little bit nervous. He had a sense of humor, though – cracking a joke about the mispronunciation of his last name based on his not filling out his application himself. And when the recognizable first notes of Stevie Wonder’s “Superstitious” started, it was immediately apparent Jon was in his element. Jon hit and held every low, high and sustained note with such perfection it would have made Stevie himself proud. Following the judges picks for the nine performers to go on to the semi-finals, the public is invited to select a People’s Choice winner to also go on to semi-finals. For the first round, Tara Leigh (#1), who performed LeAnn Rimes’ “Crazy Women.” For pictures of the first preliminary event, check out our Flikr Album. Now, here’s the thing; you can see about 12 seconds of Jon’s amazing performance, as well as all the other first round finalists, in the YourTownTV.com video, or you can come out and be a part of this amazing competition by attending the next two rounds of preliminaries, and getting tickets to the semi-finals and finals coming up. Trust me, being there is sooooo much better. Go. You’ll thank me. 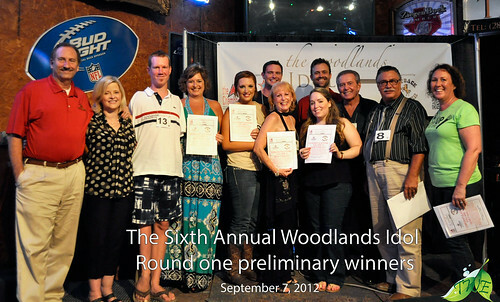 The second preliminary round of The Woodlands Idol is Friday, September 21, followed by the third preliminary round on Friday, October 5. Those two nights are free to attend. The semi-finals on Friday, October 19, and finals on Friday, November 2, are ticketed events. All events are being held at Papa’s Ice House in Spring. Tickets are only $10 and can be purchased at each of the preliminary events, at all of the Woodlands Area Chamber of Commerce free business networking events (see our Event Calendar for dates and locations), at the Chamber offices of course, and by mail, when you download the ticket order form and finally, at the door. The sooner you get your tickets, though, the better as space will be limited. For more information about The Woodlands Idol competition, check out our Woodlands Idol page or The Woodlands Idol official site.